Cap up to 20 cm, at first hemispherical, then convex to flat-convex, greyish, dirty whitish with some ochraceous tints, yellowish white, yellow, ochraceous to brownish, gradually developing olivaceous tint with age, sometimes spotted orange or reddish, dry, smooth, blueing strongly when bruised. 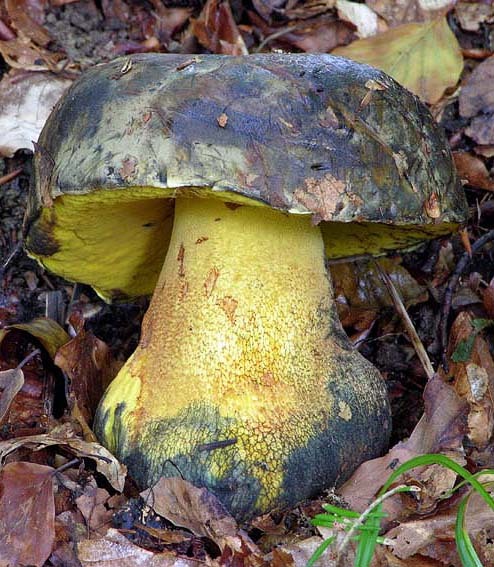 Stipe clavate, bulbously swollen at the base or cylindrical; almost entirely cream, lemon yellow to bright yellow, often spotted reddish or rusty, covered throughout with well developed fine, whitish, yellow, reddish or brownish network, blueing when bruised. Tubes at first lemon yellow, then bright yellow, finally with somewhat olivaceous tint, blueing when damaged. Pores concolorous with the tubes, blueing when bruised. Flesh lemon yellow, blueing strongly when exposed to air. Smell somewhat unpleasant. Taste not distinctive. Spores 13–16 × 5–6.5 μm, ratio 2.2–2.7. Pileipellis (the cap cuticle) trichodermium of interwoven septate hyphae of cylindrical, finely incrusted cells. Chemical reactions: hyphae of the flesh in the stipe base amyloid with Melzer’s solution. Habitat. Warm broadleaf forests usually on calcareous soils, mycorrhizal with oaks (Quercus), beech (Fagus) or sweet chestnut (Castanea). Distribution. Seen throughout much of Europe and reaching Caucasus in the east, but seldom everywhere; apparently a southern species, that is absent in north. Similarity. 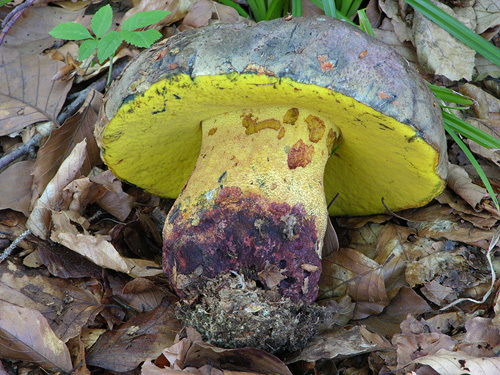 Boletus torosus is one of the few European Luridi with yellow pores, slightly similar to Boletus poikilochromus. 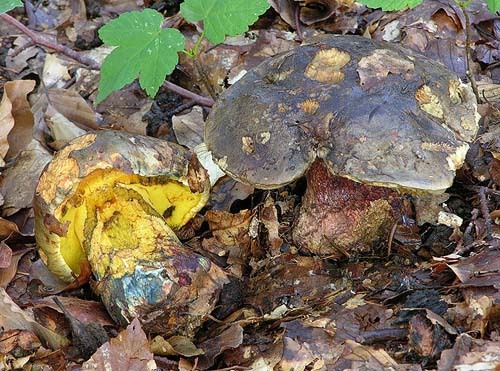 In the past and even nowadays it is sometimes confused with Boletus luteocupreus, the later having red pores. 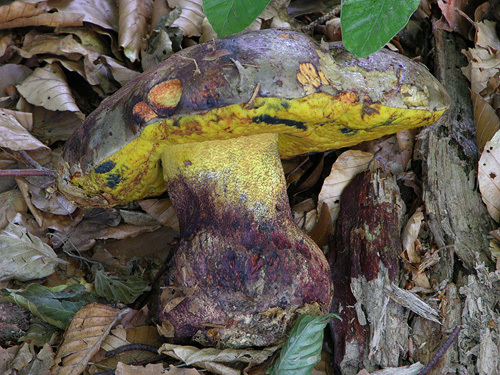 Compare also with Boletus radicans which has distinctly bitter flesh. Brillouet, J.-M. & Brillouet, T. 1993. 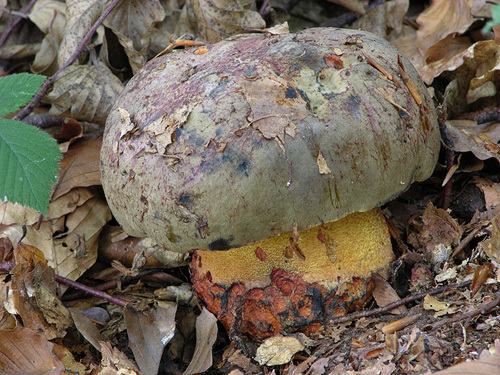 Descrizione comparativa di raccolte di Boletus xanthocyaneus Ramain ex Romagnesi e di Boletus torosus Fries. – Rivista di Micologia 36(1): 65–72. Estadès, A. & Deïana, J.C. 2004. 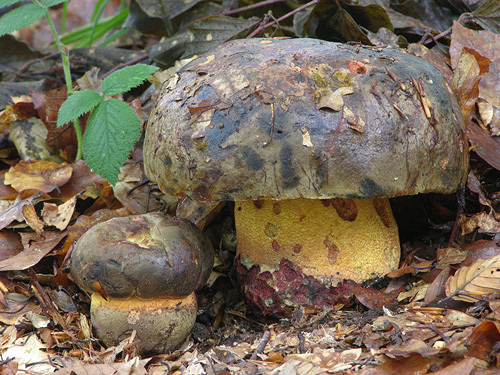 Boletus xanthocyaneus et Boletus torosus. Deux espèces distinctes. – Bulletin Mycologique et Botanique Dauphiné-Savoie 127: 15–30. Hills, A. 1997. 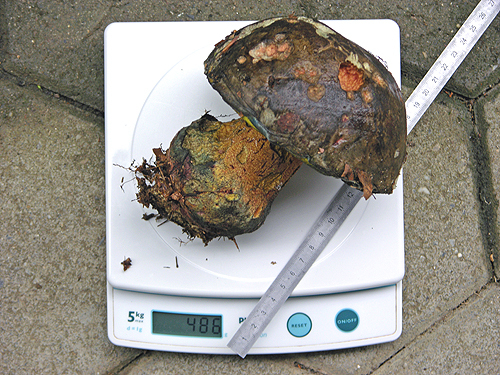 Notes on British species of the Boletus torosus complex. – Mycologist 11: 159–164. Redeuilh, G. 1992. Contribution à l’étude des bolets. 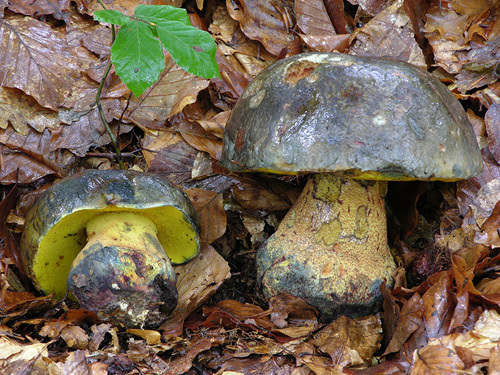 II: Etude critique de Boletus torosus et Boletus xanthocyaneus. – Bulletin trimestriel de la Société mycologique de France 108: 155–172. Simonini, G. 1995. I Boleti della sezione Luridi a viraggio violento: problemi tassonomici. – Mycologia e Vegetazione Mediterranea 10: 88–112.